As for the butterflies, they remind me of my childhood. I got my first paying gig as a crochet artisan when I was nine. My grandma (yes, Mema, who I live with) and I had been at a holiday craft fair and saw some adorable crochet butterfly pins for sale. They were, like, $1 each (which was crazy huge money at the time, at least to my 9 year-old brain), but my grandma bought me one anyway. Being the original Junior Crochet Dynamo that I was, the first thing I did when I got home was try to figure out how it was made. I didn't actually take it apart, but I came close. It took me a couple of days to make a pattern that looked virtually identical to the butterfly pin. It was at this point that my grandma, being the savvy Christmas shopper that she is, offered me a job. 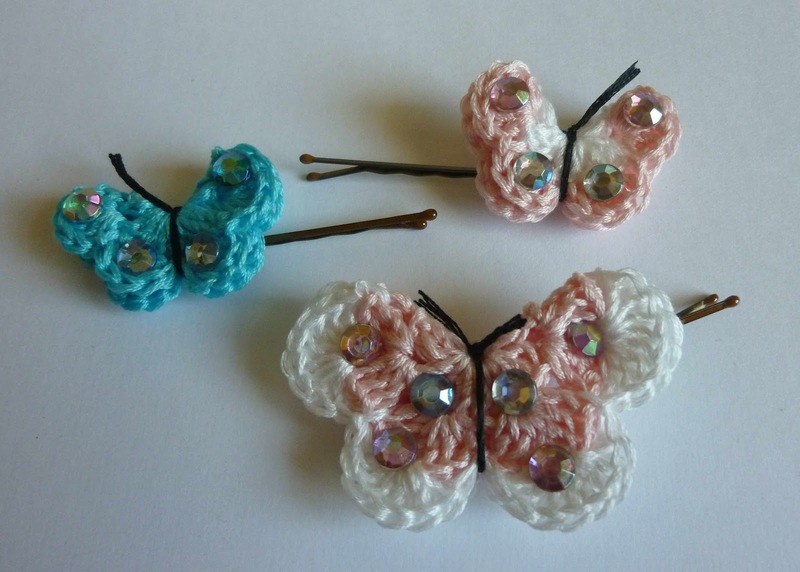 If I made enough crochet butterfly pins for all of the women that she worked with, she would pay me a quarter each. EACH!!! It was like the greatest deal of all time. I got to crochet a dozen butterflies, they would go to good homes, and I was getting paid for it! Best. Christmas. Ever! LOL!!! Well, I made her the dozen butterfly pins that she had ordered, and I threw in an extra, just for her. She ended up hanging it in the kitchen, where it hung for nearly 25 years, until a plumbing disaster forced a kitchen remodel (don't even get me started on THAT drama! Yikes!) about 2 years ago. 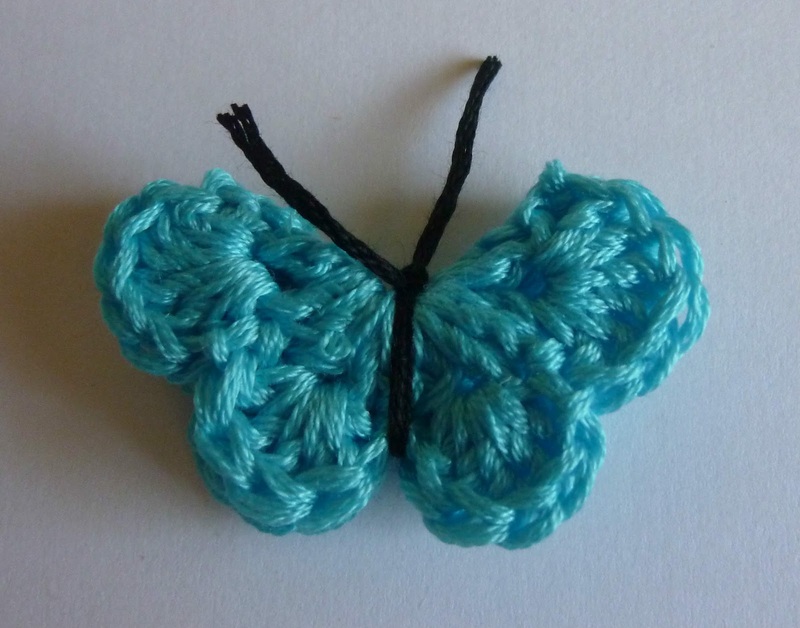 Which meant that when I wanted to do a cute butterfly when I first started Crochet Dynamite, I had no idea where my prototype butterfly was. I was certain that the internet would hold the key to my happiness. I searched and searched and couldn't find any crochet butterflies that looked like MY butterfly. Finally, I found a pattern via my friend Mariel's website http://haakmaaraan.blogspot.com/ (which is an amazing source of inspiration, btw! Have you checked it out yet?) that I thought might be right. It sure looked similar. Fold butterfly in half. 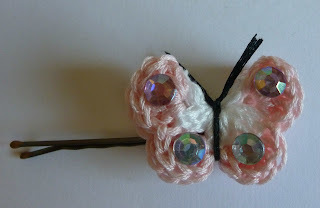 Using an 8 inch length of black embroidery floss, tie the butterfly together, using a square knot at the top for a head. Leave about an inch of floss to be the antennas when you trim the extra off. Now, if you're a normal person, you can use these butterflies for anything. I'm thinking they would make a sweet mobile for in a nursery... Or, do what I did, and just run a bobby pin through a few of the stitches on the back of the butterfly. Hi Mariel! Thanks! And I really do adore your site! Must tell you... my son came home from kindergarten to say: I love kindergarten, she made me an assistant teacher 'cause I can read!" have adopted this pattern for various projects I've made. Even made one as embellishment for a little dress I recently sewed for my granddaughter. Good luck to Mims (and you!) on the first day! I love those butterflies, and Mim's hair is beautiful!! Princess beautiful. Piper, Mims was so excited when I told her you said her hair was princess beautiful. She insisted that she had to wear her Rapunzel dress the rest of the night... LOL! Piper's right, that's some seriously gorgeous princess hair. LOL!!! Ooops. I should be more careful with my disparaging remarks about stick-on rhinestones in the future. My mom thought they were really pretty too! I love butterflies and yours are the right size and have a perfect shape. Thank you for the explanations. These are lovely and my goodness, Mims should be a hair model! I think I would like to make up a few of these butterflies to adorn some gift packages and they can do double duty by becoming barrettes after the packages are opened! Thanks for recreating your childhood butterflies and sharing! Hi Teeni! Ah! Gift packaging!! Brilliant! You are so smart!!! Ha! Yes! Hair model! Put that child to work! Hi Girlie! You are so welcome! Thanks for checking them out! 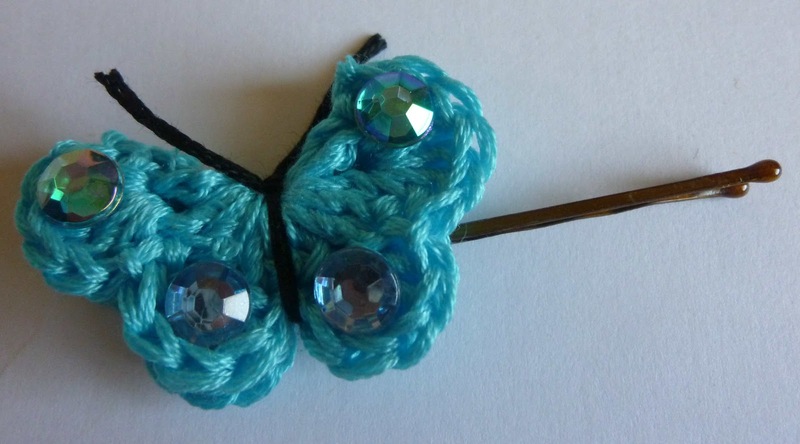 Did you use the embroidery floss to crochet the whole butterfly? The photos look more like yarn. I've made butterflies before but my wings were all the same size.. I like yours better!! I like the upper wings larger than the bottom wings. I also forgot to ask, how many strands of the floss did you use? Hi Jaime, i so love your butterfly, i created one right away. I have 2 daughters in high school & i'm sure they would love these. Although my 2nd to the youngest son is the one whose taking an interest in crochet, lol. He's making friendship bracelets for his friends. Btw Mims' hairdo is gorgeous !!! Hi Zoulie! Thank you so much! I think it's awesome that your son is making friendship bracelets. I can't wait until Mims is old enough to crochet, too. I love the blinged out butterflies!!! And her hair is amazingly adorable :) You did super duper! These butterflies would be so awesome as pins for the hospice kiddos as well... Dang, another reason I need to step it up to learn. I felt foolish when you tried to teach me though... like I was hopeless and no way I would ever get "good"
Aww, I am so sorry! Come over and try again. In fact, you should come next week! We're getting together again, and I would love it if you would come!!! And even if you can't make it (ugh, jobs!) I will make you a bunch for the hospice kids! I bet some of the awesome people on here would help too, if you had an office address or something that we can send them to. It has occurred to me that I should have emailed this to you... I'll email you too. I love this, especially that it can be simple or blinged up. I have a friend at work who's a butterfly *and* bling freak, so I'm gonna make her a bucketload of these! LOL!!!!! I am so happy you found me, sisterdonna! This just cracked me up! Whew! Lucky the pattern was worth the wait! LOL!!! Hugs! So cute, can't wait to try these! I have been trying to make flowers for a little girl's hat BUT I believe that your butterflies will give the "just-right" look I need. Hi Lorraine! The butterflies look SO good on hats! 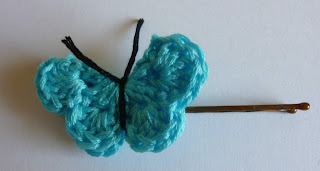 If you check out my "To Make a Crochet Donation" page (click the button on the right in the sidebar) you'll see lots of other samples of the butterflies, including one on a hat! Hi jacqsuerae! What a cute idea! I'll have to try that! The little butterflies are like the angelic souls of the slain innocents and a sweet and comforting thing. And to make a mobile of them would even be a fine fundraiser. I am sending this on to the crochet group leader. Hi Elle! What a wonderful, and heartbreaking, project. Please use any of my patterns for your project if they can help. Let me know if I can do anything else to help. Big hugs!!! Love the site,I make these butterflies but instead of putting floss to hold it together,I fold as directed and cut a pipe cleaner in half and put that.One pipe cleaner makes a pair then I stick magnets on back and put them on my refrigerator as magnets,I love them and so does everyone else..great little gifts ladies. Thanks! Great idea! I love pipe cleaners! What are the directions for starting without the magic loop? I just can't do that loop. Hi! If you chain 4 and then slip stitch the last ch to the first ch to form a ring, it should be about the same as starting with the magic loop. You may have to experiment with it a little, if you can't get all the stitches from R1 to fit you might have to start with a ch 5 ring. Hope this helps! I don't know what a magic loop is? If you use 4-ply yarn and pipe cleaners for the antenna, you can make large ones. Glue a magnate to the back of the butterfly and put them on the fridge. Fun and cute! Thanks for the idea! What an awesome pattern-hack! You're welcome! My daughter loves them too! My granddaughters' (both of them, but especially the three year old) has super fine silky hair. Most hair clips just won't stay in. My daughter found some baby sized bobby pins. I am going to check those out tonight and if they stay in, I am going to make a bunch of these for them! Your daughters hair is beautiful! So thick! Is it a deep auburn? That's how it looks in the pic. Both my granddaughters, and their mom, my daughter, are red heads! And so is her husband! Girls had no chance of being anything else. LOL! They are a ginger family. I think some blue ones and mint green would be pretty in their hair. Hi J! OOh, blue and green would be so pretty! I've heard that spraying the bobby pins with a shot of hairspray helps keep them from sliding out of fine hair, if the baby pins don't stay in place. I'm keeping my fingers crossed for you!! Hi Mary! So glad you like them! What is the profile? I'm not familiar with this. Guess I can't get my question answered. The way I've printed things off the blog is by highlighting the post, copying it, and pasting it into a Word program (or other word processor). Then I just print it from there. So glad you like the pattern! I used a size D susan bates hook and was tickled pink to have something to use up my Floss on. I was able to make 24 butterfly before my Floss supply was exhausted. They will be perfect to sew on sleeves of short sleeved pullover crochet baby sweater and I am thinking of doing a baby afghan in white and attaching colorful butterflies done also in baby yarn. I used baby yarn and a G hook for my sample butterfly so I know it is perfect to decorate my baby afghan. Thanks for sharing this pattern. Hi! These are such cute ideas! I'm so glad you're enjoying the pattern! Thank you so much for the butterfly pattern. I have floss from my embroidery days - so long ago.... and what a great way to use it up. Also you are right there are so many colors compared to thread yarn. So darn cute and I love the rhinestones and so will little girls; they love bling!! I have to admit me too LOL. Hi GreenTea! I love bling, too! I also love using up materials! So glad you're enjoying the pattern! This pattren came at just the right time for me. My nephew is having a son in April. No he's not going to have butterflies in his hair. I have a niece that will be almost two when we have the shower at her house. I don't want her to feel left out because of the new baby so I bought her 2 headbands. I'm going to put the butterflies on them. Maybe 2 on each. I think she's too young for the rhinestones but I have some gold crochet thread I might use. I found your site a few days ago and I love your stories about you and your family. Your free pattern will help me a lot because I'm on a fixed income. Too cute! I'm so happy that you like the pattern! Wow, thank you for the lovely words! This means so much to me. Hi Janette! Thanks for the sweet comment! Made my day! Super cute idea! I think my little girl will love them! Thanks, Lara! Glad you like it! 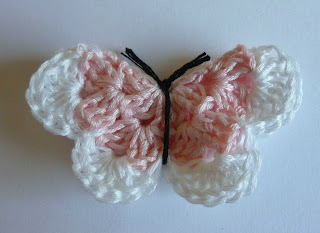 Jamie, love the butterflies thanks for pattern and link to. Marie's lager butterflies. But I really enjoyed reading about your Mema it hits home. Thanks for sharing. I've found that a lot of us relate to each other while doing this blog, and it always seems to help me feel better when others share their stories, too. Thanks for the lovely words. Could someone please tell me what the "magic loop" consist of. I really want to make these but I have never heard this term...thank you so much! Hi, Anonymous! Please scroll up to other comments, where I've answered this a couple of other times. Hope that helps! Your butterflys are very beautiful! Thanks for sharing the link of haakmaaraan! Super! Thanks for the lovely compliment! I appreciate it! Footless baby sandals! Adorbs! What a great idea! Hi. I am a return to crochet girl, well woman, and I found your butterfly pattern. Unfortunately I have never done an item from a pattern so I am confused. Do you know of anywhere which will explain the terms of the pattern? Thank you for this very cute pattern. I normally like to use very large hooks (like M, N, and especially Q), so this will be a challenge for me. But they are so cute that I just need to try it. Our first granddaughter is due in 3 weeks....been waiting 27 years for a girl in the family. It's too early to make them for her, but I can see butterflies in her future! I was thinking too about trying to somehow add a crochet chain to the top after folding it and making it into a bookmark...how cute would that be. I did not notice...do you allow people to make these to sell? I understand if you don't, but thought I would ask. Thank you again! Hi Jamie :) I love the butterflies; thanks a ton for the free pattern. I can't believe nobody has asked this yet: can you do a tutorial on the braid? 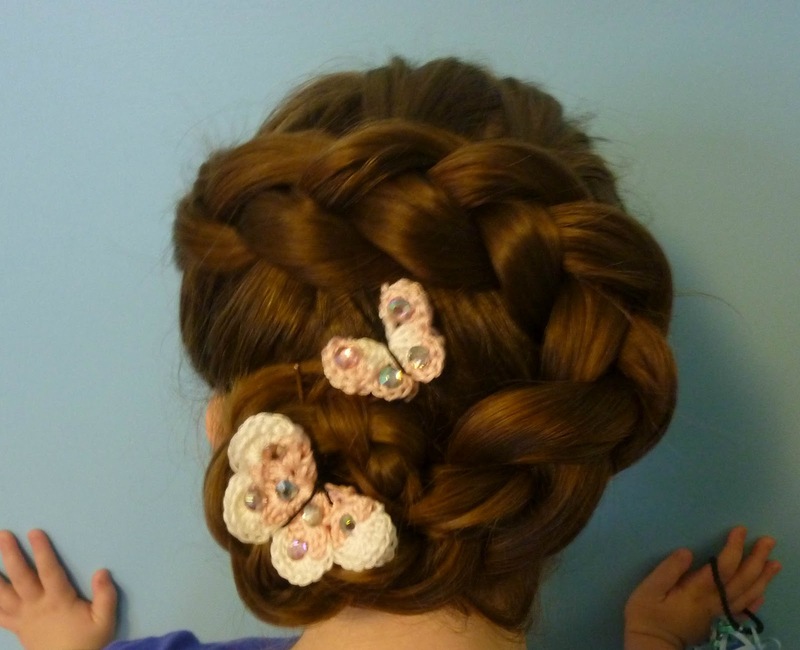 I'm a granny with two grown princess daughters and three teeny princess granddaughters (all of whom have insisted on long hair their whole lives) and the French braid has always been a life-saver. YOURS is the prettiest braid I've ever seen. Hi I love this pattern my daughter and I both love butterflies, I read in a book that butterflies are God's way of showing he believes in second chances. I will be making a few of these. I have a bunch of those little Lion Brand bom yarns that I have been trying to figure out what to do with...I think I am going to make a bunch of butterflies and flowers and put them on a pillow cover for my grand daughter! They will be adorable! As usual I will be copying your wonderful patterns. I would love a print friendly page! Hi, Jamie, thank you the beautiful butterflies! Do you think that it will good for a pair of earrings too? Ok, Can I just say, first, Love you!!!! !, Butterflies have been my 'thing' since losing over 200 lbs, the whole Caterpillar to butterfly. But Besides that I was looking for something to finish off a scarf I had made for my sister, but didnt know what I needed till I found my self HERE!!!! Thank You!!!!!!!!! What is a magic loop? Sorry, I'm just a beginner. a magic circle is:There are several ways to start a round. One of those ways is the magic circle. The magic circle allows you to pull the hole closed. 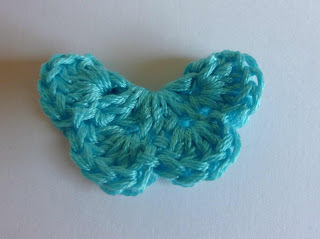 Follow this tutorial to learn this stitch. 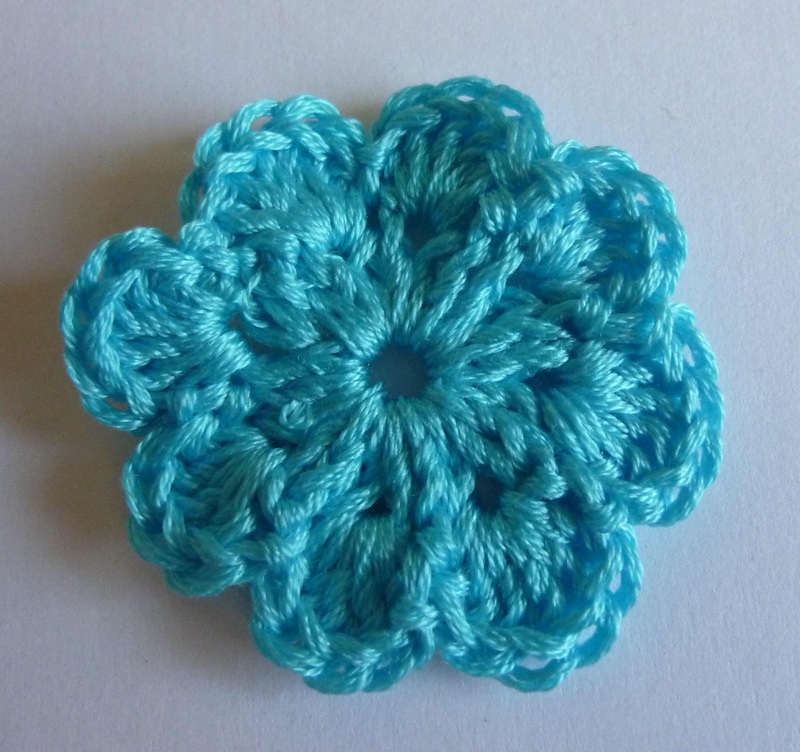 When crocheting in the round, there are several ways to start. 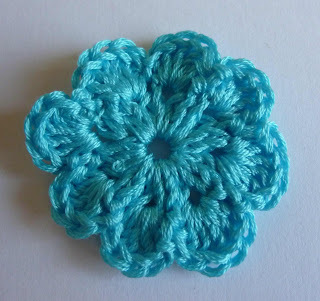 You may chain 4, slip stitch to join and form a ring. You may begin with the magic circle. The first two methods will leave a hole in the center of your work. The ‘Magic Circle’ will allow you to pull the hole closed. To make the magic circle, first begin in the same manner as usual in crochet. Pick up the yarn again, to make a chain stitch. Photo below shows the magic circle finished, with the hole gathered closed. I've just made three of these little butterflies and love how they've turned out. Mine will most likely end up being hair accessories too. I've struggled to find a butterfly pattern I liked so thank you so much for this one - it works great! I've done a little chain and tied it at the top to make the body a little more noticeable but that was the only thing I did different. I too would like to know what the larger pattern would be. These are adorable and I'm making them for my niece but she's older and the larger one would be better for her. :) I'm assuming that the larger pattern would just be bigger dc clusters on rnd 1 and therefore more st in rnd 2 in the ch sp but would love confirmation on that. Both of the links to the other patterns are not operational anymore. Thank you. :) And thank you for the lovely free pattern!